Thomas Richner may need to consider a career change. 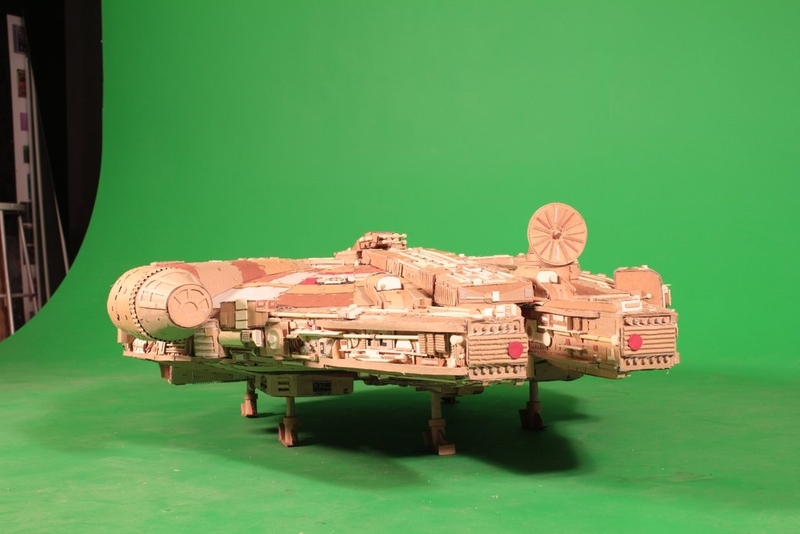 His hobby of recycling cardboard into interesting items, like an R2-D2 and a Millennium Falcon show enough promise that, well, someone should hire him to keep it up! This incredibly intricate Millenium Falcon has actual retractable landing gear and details that are, well, out of this world! You can follow along while he builds it over 140 hours in the pictures below taken from Thomas’ imgur gallery. We had some empty boxes. Could recycle them. Or, could build a five foot Millennium Falcon in my basement. Went with the latter. Started with an outline of the base. Wanted the structure to be strong enough inside to allow it to be moved. She holds together pretty well. Studied some photos of the actual ship that was built for the original movie and followed some of the basic design and construction techniques. Built a set of landing gear that is retractable. Spent some time measuring the pieces against the dimensions of the actual models. Wanted this one to be the same size as the large model used in the first film. It’s actually a little bit longer I think. I took some liberties with the design (it ended up being a real mixture of an off the shelf snap together model kit I had, the 1977 Millennium Falcon Kenner toy as well as photos of the actual movie ship) and intentionally allowed it to be a little irregular to retain the feeling that it was made by a person. Close up of one of the landing gear. The radar dish base swivels and is attached by a magnet which allows it to be removed when transporting the model. Began to overlay the hull pieces. Used a combination of hot glue (which dries very quickly and holds tightly) and wood glue to attach the outer skin. At this point, it began to resemble the ship. Here and there, I would start working on the details around the outside of the ship. These details took a bit longer than the blocking in of the basic structure of the ship. Had to do this… like the shot in ESB when the ship flies through the trench on the asteroid to evade the pursuing tie-fighters. Yep… geek! Laid out a pattern for the many pieces that would be cut and glued to the outer hull for that paneling effect. More details on the side of the ship. Back of the ship around the engines. This is the underside of the ship. You can see the landing gear hatches that slide back to allow the landing gear to retract. The radar dish was fun to make. It does swivel and turn freely. Everything is made out of cardboard, and some balsa wood for the pipes running along the hull of the ship. When he was done building, he took it to the Columbus College of Art and Design to do a photo shoot in front of the green screen. He brought along his paper mache R2-D2 for good measure. 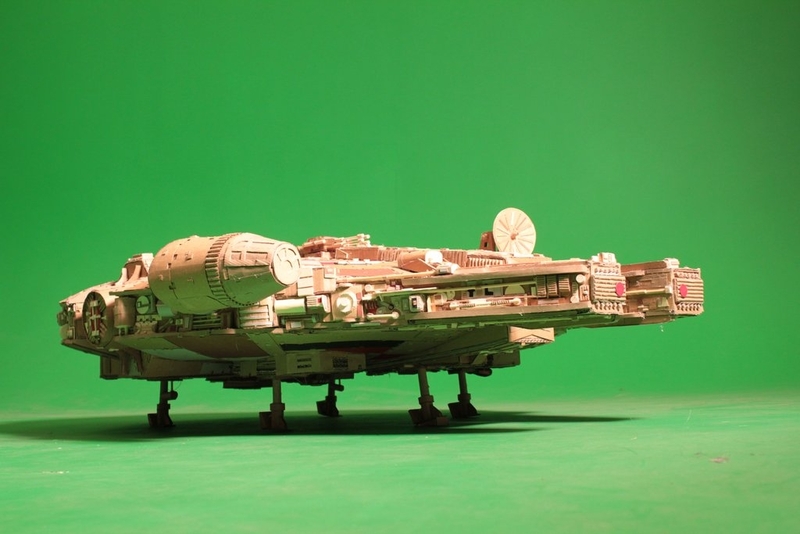 Shot the ship on a green screen set at The Columbus College of Art and Design. Felt like we were on the set of one of the films. Lots of fun. He couldn’t resist putting that green screen to work either!